Combines the most valuable leather care of the classic Effax leather balm with an innovative anti-slip effect. The newly developed Grip Technology with anti-slip effect ensures a more secure seat without any stickiness and does not leave residue on the leather. Easy to apply with the sponge included. Effol SuperStar-Shine will give your horse or pony a more brilliant shine than ever before – but without the coat, mane and tail taking on an artificial feel. Grooming becomes easier and the effect is guaranteed to last for several days. The Shine-Spray will help you to undo tangles as well as remove particles of shavings, straw etc. with virtually no effort during grooming – the tail and mane will take on more body and bounce as well as greater volume. It will also successfully overcome the problem of split, dry hair. The skin-friendliness has been dermatologically tested and classified as "very good". TIP: Spray Effol SuperStar-Shine onto your horse's coat before clipping. It will facilitate your work enormously. Cleans and care for the leather fibre in a unique way from the inside, without making it greasy. High-quality additives supply the leather fibre with the necessary nutritional substances thus keeping the leather soft, supple and tear-proof. And no greasy film remains on the surface. The optimum deep cleaner. 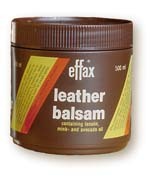 If required, leather equipment may be given follow-up treatment with Effax Leather Balsam or Effax Leather Oil. TIP: To use: dampen a small sponge or cloth with EFFAX Leather Combi and wipe away dirt, grease and sweat. After use the sponge may be rinsed in water and left to dry in readiness for the next use. Nourishes, cares for and protects all smooth leathers. The combination of Vaseline and other valuable leather-care substances ensures durability and thus also the reliability of your leather equipment – a great plus for your safety. Completely free of acid and resin. TIP: Apply to the under side of new leather with a sponge or soft brush. Effax leather saddle cream is a popular creme saddle soap made using natural oils and extracts such as Avocado Oil, Coconut Oil & Aloe Vera. This leather cleaner will cleanse and care for all types of modern leather products including saddles and bridles, leather riding boots and leather items such as handbags. Contains care additives such as beeswax, lanolin, avocado oil. Apply to nourish and restore dry leather. 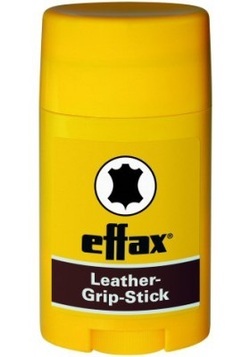 The Effax Leather-Grip-Stick gives the leather a firm and perfectly uncomplicated grip – all the time, everywhere. With the twist and turn stick the active substance is easy to apply – without any danger of damage to leather.